PH10 Motorized CMM Probe Head - CMM Inc.
PH10 motorised indexing heads allow flexible and repeatable probe re-orientation, which results in an overall improvement in the CMM’s capability and productivity.They are also designed to position the probe at one of 720 positions, giving access to the most difficult-to-reach work pieces. Renishaw’srange of PH10 motorised heads are comprisedof three models: PH10M PLUS, PH10MQ PLUS and PH10T PLUS. Each of these models can carry a range of probes and extensions and can be orientated in 720 repeatable positions. All three variants of the PH10 heads are also supplied with a revised repeatability specification, down from 0.5 µm (2σ) to just 0.4 µm (2σ) (specified at a distance of 62 mm). Furthermore, PH10 Motorized Probe Heads are physically differentiated by a new ‘aqua blast’ finish which gives a modern, matte black appearance. The PH10M is capable of carrying long extension bars and complex probes. Also, the highly repeatable autojoint allows rapid probe or extension bar changing without the need for re-qualification. The PH10MQ is a modifiedversion of the PH10M, which is described above. It allows the motorised head to be attached directly to the quill with the B axis of the head (which is located inside the quill). This will effectively provide a neater and shorter probe mount, with only the A axis protruding from the quill. The PH10T has a similar design to the PH10M, but instead of the autojoint, it features an M8 thread probe mount. 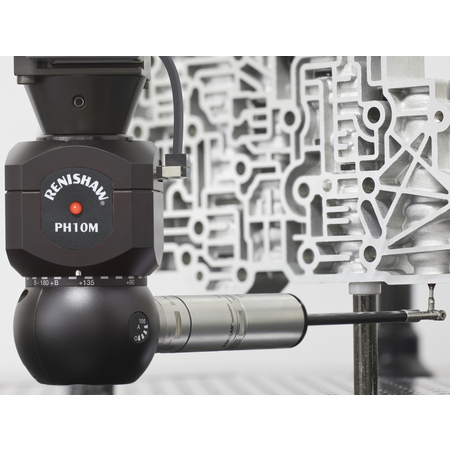 The PH10T is also fully compatible with all of Renishaw's stylus and module change systems.